"O Say can you see..."
Windham Primary School A house third grade chorus members lead senior citizens in the Star Spangled Banner on Friday, March 14th. The third graders were the featured entertainment at the Grant Fund Senior Citizen monthly luncheon in Portland. The students practice once a week on Friday afternoons. Nancy Cash-Cobb is the director. 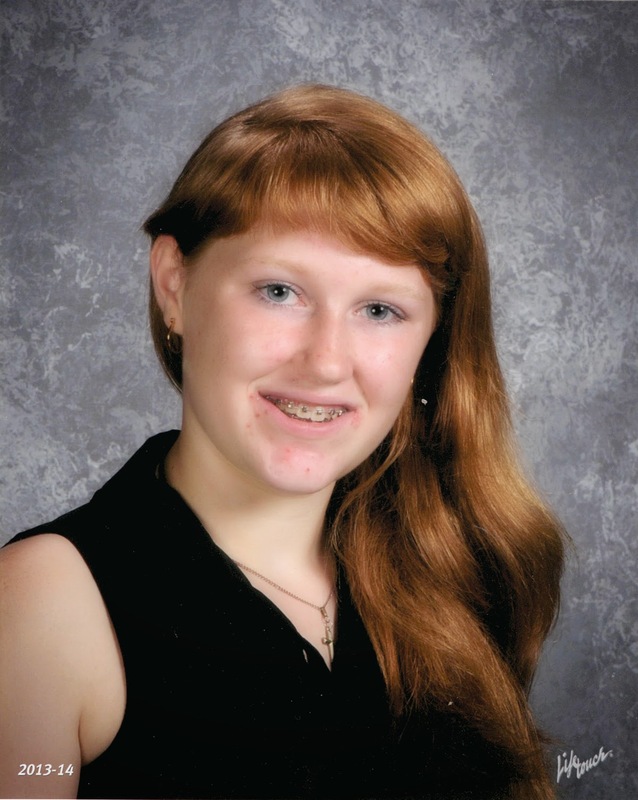 Isabella Rosborough, an eighth grader at Windham Middle School, is The Windham Eagle student of the week. The 14-year-old is motivated and driven. She plans to attend four to six years of college to become a power engineer and work with wind turbines. I would like to travel and eventually settle down and have a family. “Isabella always listens to her peers, showing a genuine interest and then adds rich exchanges coming from her own experiences and thinking. She is a very independent thinker and doer. She embraces responsibility and is a young woman who defines her personal and academic growth with a manner of marked maturity,” said Gwen Roberts her language arts teacher. Isabella is the daughter of Alison and Bob Rosborough and has a brother Mason. She has two cats, Willow and Delilah. Favorite movie: All hero movies like “Marvel Movies”. Hobbies: Play the flute, swim, play soccer, reading, and traveling. Dirigo Boys State the 67th Annual American Legion Dirigo Boys State will be held at Thomas College in Waterville, during the week of June 15 to19. The purpose of Boys Sate is to provide Maine junior boys the opportunity to participate in an emersion program of government by role-play. They learn how to campaign for state office and then organize and carry out the functions of state. The Field-Allen Legion Post 148 of Windham is again sponsoring candidates for this unique program and will pay the tuition cost of $275 for each selected candidate. Each candidate, however, is responsible for their own transportation to Waterville. Last year 220 junior boys from all over the State attended Boys State. The Dirigo Boys State goal this year is to expand that number by 50. Boys State is looking for interested juniors with priority given to attitude over Scholastic abilities, although both qualities are desirable and will be considered. Junior boys desiring to attend should make their intentions know to their school guidance office. Individuals in private schools or those being homeschooled may submit their names to The Legion Post Americanism Officer, Dennis Marshall a 627-1014. Are you a band member? Boys State also has a 40-50 piece band under the supervision of a qualified musical director. Candidates with band experience are required to bring their own instruments. Applicants will be evaluated by the Legion Post and a selection made as to the student being a designated as a primary or alternate. Participants must commit to attending prior to their application being submitted to Dirigo Boys State. More information and applications are available by going to www.mainelegion.org and going to form and application or by contacting your guidance office or the Post Americanism Officer at 627-1014. The Local Legion Post has established a May 15th deadline for applications. Incomplete forms or forms submitted after this date will not be considered. All completed forms and school endorsements must be returned to the Field-Allen Post for submission to Dirigo Boys State. STANDISH - Last year, the Portland Water District (PWD) announced the creation of a grant program that offers free water bottle filling fountains to local entities. Twenty-six applications for grants were received, and the Board of Trustees awarded four water bottle filling stations to: Saint Joseph’s College (Standish), YMCA (Portland), Portland Transit Authority (Portland), and Greely High School (Cumberland). Saint Joseph’s College is the first recipient to install the station. The station was fully operational as of January 10. The Trustee sub-committee that reviewed applications was impressed with Saint Joseph’s history of stewardship of our resource and their efforts to promote drinking tap water. The installation in the Harold Alfond Center also provides significant exposure and access. In the 2012–2013 academic year more than 70,000 visitors used the facility. Water bottle filling fountains are gaining popularity across the country. 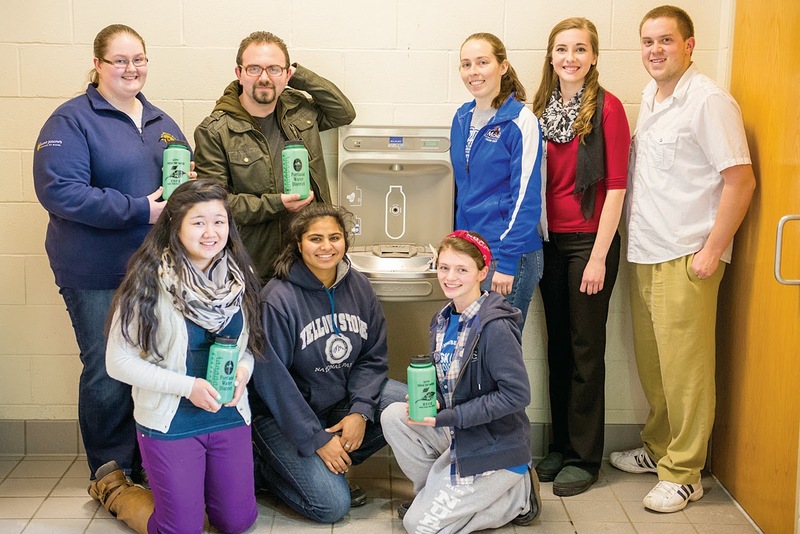 At Saint Joseph’s College the Eco-Reps, a student group that promotes sustainable behavior, has embraced the fountain and is encouraging its use by subsidizing branded water bottles and T-shirts. The water bottle filling station is a fitting addition to Saint Joseph’s College’s environmental initiatives. Supported by its mission and core values, the College strives to cultivate a stewardship ethic among its faculty, staff and students, as well as the greater Portland community. “This will help to cultivate good stewardship toward Sebago Lake’s watershed and toward our planet,” said Dr. Jeanne Gulnick, the College’s campus sustainability coordinator and an assistant professor in the natural science department. Of Facebook’s 1.23 billion monthly active users, 945 million of them are using a mobile device to access their profile and newsfeed (according to a December Facebook press release). So guess what? Facebook just launched another mobile app for iPhones to try and make your Facebook experience that much better and more engaging. Called “Paper,” this visually appealing mobile app is designed to take your visual Facebook experience to the next level. Currently only available for iPhones and Facebook users in the US, Paper offers users the ability to create sections and it operates much like a mobile friendly very organized newspaper. Within the app you can still access your friend’s statuses and photos but to add to the mix you simply tilt the phone to the left or the right to scan across a panoramic photo. Want to check out what’s going on in the world while still within the app? Simply swipe your finger down to be brought back to a home screen where you can then access “Sections” that you have the option of customizing with options like “News” “Technology” etc. These sections then display breaking and current news about those topics. So what does all this mean for marketers and business owners and does it affect your Facebook marketing strategy? Immediately I think it will have very little effect on your marketing strategy, but the one common thread with all social media trends is mobile and visual. This trend should also be on the top of your overall online strategy. Your customers no longer have to run to a computer to check their email, Facebook, Twitter or finances. It is imperative that you are prepared with a well-designed mobile responsive website that is visually appealing with great images and a less is more theory when it comes to text. As Facebook continues to design ways to communicate with their user base via the cell phone, I highly recommend you follow suit. Want to learn more about Facebook’s new app “Paper”? Visit www.Facebook.com/Paper.